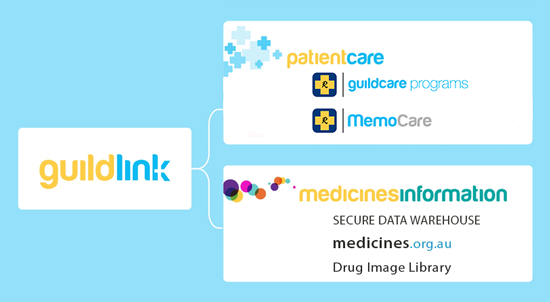 GuildLink is a wholly owned subsidiary of the Pharmacy Guild of Australia, a leading advocate for community pharmacy representing almost 5,000 pharmacies across Australia. The people at GuildLink have many years experience in the professional practice of pharmacy. They are dedicated and passionate about this industry. GuildLink is guided by the GuildLink Charter. At GuildLink the focus is on providing software solutions to the Health Care Industry with both GuildLink divisions providing a unique offering. The primary provider of software and professional programs designed to assist pharmacist to meet the requirements of 5CPA and the delivery of professional services. Patient Care division at present has three distinct products that are valuable tools to Pharmacies across Australia. GuildCare Programs was launched in 2011 as part of the Pharmacy Guild of Australia's initiative to have a national systemised platform for delivering of professional health services with a goal to position pharmacies to be ready for the introduction of eHealth and Personally Controlled Electronic Health Record (PCEHR). Expanding from its humble beginnings GuildCare currently offers five program streams - 5CPA Pharmacy Practice Incentives, 5CPA Medication Management, Private Service, Private Programs and Admin Module with 60% of Australia pharmacies subscribed to the software. The GuildCare software integrates with existing dispensing software and the GuildCare Support Centre provides pharmacies purchasing the software with training and technical support. The latest initiative from the Patient Care division is a communication solution that strengthens the link between pharmacy and its patients. In the age of ever-growing communication solutions, it is natural progression for pharmacy to become part of the bigger picture. Similar to the launch of the GuildCare programs, MemoCare will be released in a staged approach allowing for a better training and implementation. Initially launching with an SMS solution it allows the users to start sending SMS as an introduction to the program before the features expand. GuildCare subscribers will benefit from a one software solution that integrates with dispense. Since 1995, Medicines Information has been working with pharmaceutical companies, dispensing software vendors and health information providers to distribute medicines information electronically to the Australian market.